Navajo Tea and greenthread are the common names given to multiple species within the genus Thelesperma. The species we are growing and selling at Grand Prismatic Seed is T. filifolium, which is known as stiff greenthread or plains greenthread, and is a native of the Great Plains and mountain states. Growing Navajo tea is relatively easy. Seeds can be started in a greenhouse and transplanted outside, but like many plants that form taproots, Thelesperma species would prefer to be direct sown. We've had luck seeding them in early spring for summer and autumn blooms, and in late summer for plants that will overwinter and bloom the following year. We like to heavily sow ours in rows 1' apart, and then thin to 8-10" between each plant (make sure to keep the most vigorous seedlings!). Sow them in a well prepped area free of weeds and keep the soil moist until they have germinated. 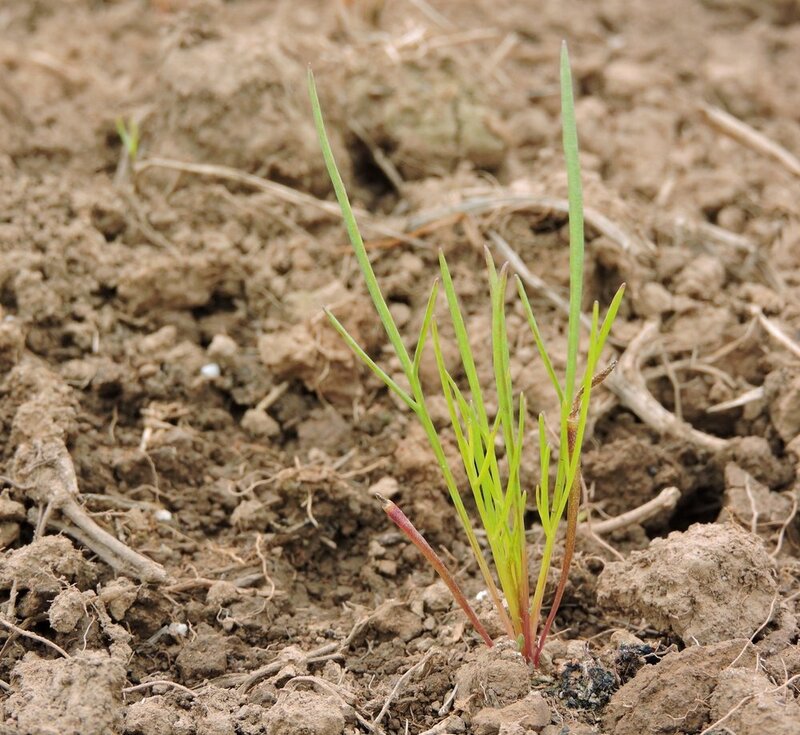 The long thin leaves of young plants (above photo) can appear grass-like when young (especially the cotyledons), so be careful not to weed them out! Once they are established, they need very little water and will become short lived perennials in their native range. The simple open flowers are popular with native bees and butterflies who can easily access the pollen and nectar. If you aren't into herbal teas or dyeing, the benefit these plants have on the local pollinator community is reason enough to grow them. They bloom prolifically and provide food for pollinators well into autumn even in poor soils and dry conditions. When the plants start to form buds, harvest the tops (leaves, stems, and buds) leaving about 2" of growth behind to re-sprout. At this stage, before the blossoms have opened, the plants are very tender and have the best flavor. You can also harvest after the plants start blooming, but the flavor is slightly bitter, and the woody stems are harder to deal with. If you give your plants plenty of water, you can achieve multiple harvests over the course of a season. Once harvested, dry the tea on screens out of direct sunlight or in a food dehydrator on low heat. Once crispy, rub the tea over 1/4" screens (or cut them up with scissors) to break into small pieces. Store in an airtight container, preferably somewhere dark to prevent the bright green color from fading. Steep a tea-bags worth of your dried material in hot water for an earthy, slightly sweet, relaxing herbal tea. Because Thelesperma species contain the anti-inflammatory flavonoid compound luteolin, we brew a large French press of it when we have aches and pains from farming. If you want to sample Navajo tea before committing to growing it, or you would rather grow it for flowers instead of chopping it down for tea, you should check out Yanabah Navajo Tea for some high quality ready-to-brew tea. They are a 100% Navajo owned family business selling multiple flavors. They also have some gorgeous R. C. Gorman mugs to go with your tea! While I'm link-dropping, Shima' of Navajoland makes a gentle honey lemon Navajo tea soap. For the colors found above, I started with four 100 g skeins of scoured wool, each mordanted for about an hour with 10 g alum and 7 g cream of tartar. I then made two separate dye baths. One bath was made by simmering 40 g of dried flowers in about a gallon of water for an hour, and the second dye bath was 40 g of whole dried plants simmered in a gallon for an hour. Each bath received two of the skeins. Since this was my first time dyeing with Navajo tea, I wanted to see how different the flower bath would be from a bath made from the whole plant. I was happy to see that the whole plant color (far right) was pretty similar to the flower only bath (far left). This means you don't have to spend your time tediously picking flowers! You can simply cut back the whole plant and throw it into a dye pot! From now on I'm planning to harvest young plants for tea, and then will cut back the entire plant at the end of the growing season for winter dye stuff. The orange colored yarn (can you believe how orange that is?!) was the second skein from the dried flower bath that was then given a washing soda dip. I don't think any other natural dye has given me such a clear and lovely orange. The coral color was the second skein from the whole plant bath, and was given a second bath made of 2 g ground cochineal, simmered for 30 minutes. "Which plant is booby-trapped?". All of our late summer and early autumn Navajo tea seed harvests started with that question. We eventually put a rock near the plant to remind us where not to reach. To harvest seeds from Navajo tea, wait until all the petals have fallen from the flower and the seeds are dry and slightly fanning out of their capsule. There is an example of ripe seeds in the above photo on the left side of the spider's body. You can easily pinch out all of the dry seeds without getting much chaff in your harvest. We usually wait until there is a large flush of ripe seeds before harvest. We notice lots of small beneficial insects hanging out in the seed heads, because of this, we recommend spreading your harvest out in the shade in a shallow container to allow insects to escape before you store your seeds. Once insects have found greener pastures, store the seeds in an airtight container (assuming the seeds feel crispy and dry to the touch).